A few days ago a community data miner suggested there was more for us to discover in Zetsubou no Shima zombies and boy was that guy right! We now have confirmed proof that the Spider Bait Wonder Weapon is real and in this guide I'll explain exactly how to get the secret weapon for yourself. As the name suggests, this Wonder Weapon is entangled with the Spider theme of Zetsubou No Shima but I'm sure none of us would have expected a controllable spider at our disposal. We have exactly that though: an overpowered, controllable spider that wrecks havoc against zombies and the Thrasher alike. Players can summon this spider at any time during a round, see the section at the end for exact gameplay details. During a spider round use the Skull of Nan Sapwe's Mesmerize mode to identify the spider with the "red mist" coming from it's back. This little fella is going to help kick start the Spider Bait weapon process so take good care of him and AVOID killing him! Note: You can complete this step without the Skull but it's a lot harder. Carefully, tempt him round the map, leading him first towards the purple water area inside of the bunker. Get close enough to the water so you can actually see the spider drinking the water. Now repeat that step for the blue and green water at Lab A and Lab B respectively. Once the spider has drunk water at all three locations tempt him towards Lab A (the one where you got the part for the KT-4). Coax the spider into the cage in a similar manner to before. Go to the control room in Lab A. Raise the cage and use your Electric Shield (melee) to shock the cage. Now lower it again. This might sound like a duplicate step but it's important that the cage has been shocked otherwise the Wonder Weapon process will not start. Complete the subsequent two rounds and another spider round should commence thereafter. Notice that all of the spiders in this round have the red mist to signify that the Wonder Weapon process has started correctly. These spiders are much stronger than their lesser counterparts so be careful and make sure to kill them all as quickly as possible. As soon as the spider round is over, rush back to the cage at Lab A. Use the control panel to raise the cage. A cocooned spider should be inside the cage and the machine will extract a red liquid from this beast. Collect the red vial labelled as "Spider Bait" on screen. Congratulations you now have the Spider Bait weapon!! 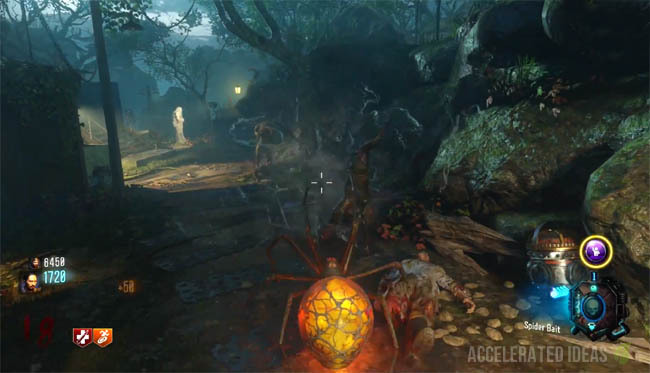 The Spider Bait weapon allows the player to transform into one of the smaller spiders. 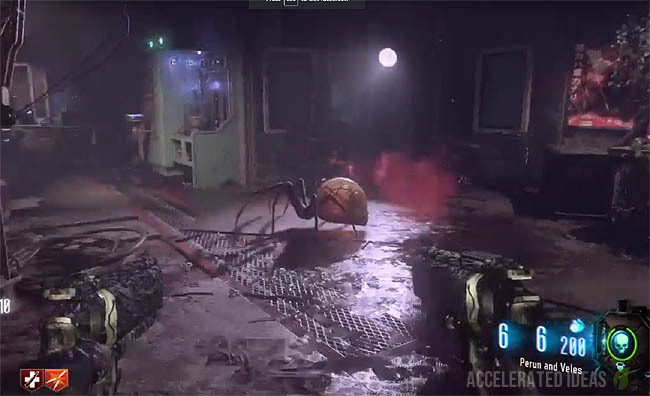 Once transformed the player cannot get downed (because they are cocooned) and they have full control over the spider to attack other zombies, spiders and the Thrasher. The controllable spider event ends when either the spider is killed or the player ends the process by holding down the square button. Simply press RIGHT on the D-Pad to instantly transform into a spider. The screen changes to a third person view of a spider, which you now have control of. 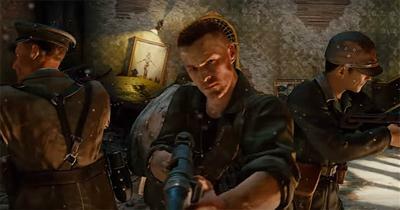 The spider is relatively slow (sadly) but it's web shot is incredibly deadly, killing zombies with one hit at round 30+. The Thrasher and other spiders also have little hope against this powerful little creature!